Dwight, VE7BV will be active from Guatemala 22 January - 17 February 2015 as TG9/VE7BV. He will be active on 20, 17,15m CW, SSB. Guatemala is a land of a rich and diverse history and exquisite natural beauty. As a cradle of Mayan civilization, many ancient sites and natural beauty give it an appeal that is seldom matched by any other location. The official language in Guatemala is Spanish. It is located in Central America, bordered by Mexico, the Pacific Ocean, Belize, the Caribbean, Honduras, and El Salvador. Its population numbers above 16,000. The stunning blue of the Caribbean is one of its borders. The underwater caves provide thrilling tubing or canoeing experience. Coffee farms add to the beauty of the country, and provide one of its top resources for trading with the United States and with other Central America countries. Aquateca has some of the most preserved ruins and are still being processed by archeologists. Tikal is perhaps the largest and definitely the most impressive of ancient Maya sites. Tours are organized to take advantage of the enjoying the exquisite view of the sun rising above the ruins. Yexhá owes its reputation to the fact it has more than 500 structures. The pyramid is one of the most popular and historic attractions in Guatemala. It dates back to the 8th century A.D. It is 125 feet high and is one of the major temples at Tikal. It has been more fully restored than any other of the temples. The base of the pyramid covers over 16,000 square feet. Graffiti within its interior dates to the Classic Period. After rising through three levels, there is a platform decorated with two grotesque masks, giving it the name of the Temple of the Masks. Its steps have been damaged over the years from tourist traffic, but it still is a major attraction worth traveling to see. 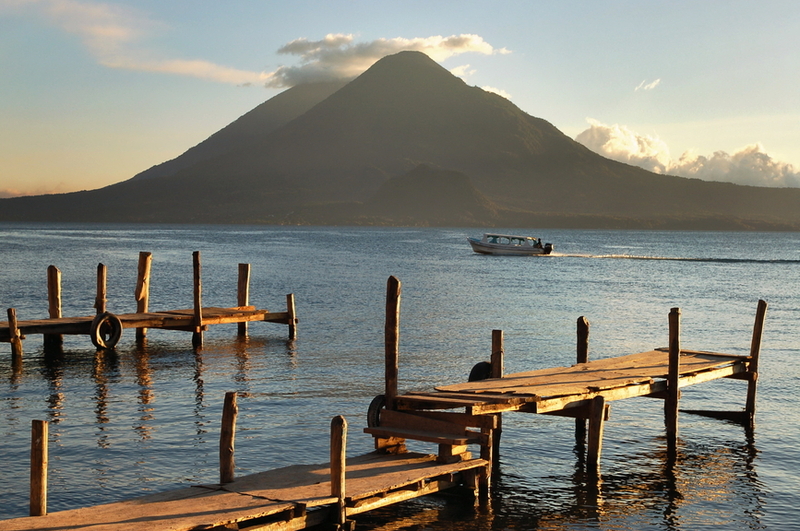 There is no place more beautiful than the beauty of Lake Atitlán and the surrounding villages. Its atmosphere is very relaxed and an excellent example of Mayan culture. Visits of from a weekend to several weeks will not exhaust one’s interest. The lake is at the top of the highest volcano, the Tolimán volcano. 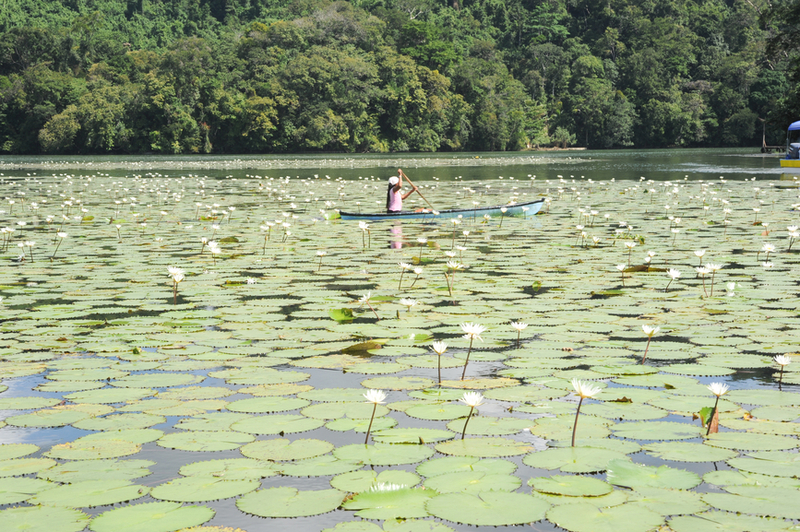 Travel around Guatemala and to nearby attractions is by small boats, called lanchas. They can be hired privately or for public transport with many other riders. Public transport has schedules for planning travel as needed. Private transports can be hired on one’s own schedule. The number one attraction is the Indian Nose Mountain. It gets its name from the fact that it looks like the face of a Mayan lying on his back. Treks up the mountain are best planned in the early morning so as to get an awe-inspiring view of an exquisite sunrise. Along the climb up there can be seen many locals climbing up to work the coffee farms and cornfields. They carry packs on their backs with the days needed supplies. There are many avenues up the mountain, and even organized trips on horseback. At the top is the most awesome view of the pure, blue waters of Lake Atitlán. The volcanic cone at Lake Atitlán, with its mineral-rich ash, is the ideal medium for the coffee and corn, or maize that are the main crops of Guatemala. The methods used to grow the crops have changed very little over the years, as the local people have found them to be very successful and have striven to keep the old ways. Other attractions provide beauty and history and a taste of nature. One is the Castillo De San Felipe, an old fort that protected the town from pirates in the early years. Another is Quiriguá, which is an ancient ruin that can be explored. The Finca Paraiso (Hot Springs Waterfall) provides a scalding hot waterfall that falls into the icy water of the river, providing an excellent swimming experience and an interesting cave to visit. For those who enjoy adventure travel, Guatemala is rich in adventures to enjoy. Bike tours take you through colonial town and up to coffee farms. Zip lining is available for those so inclined, as is aerial canopy tours. Magnificent underwater caves provide great exploration and cave tubing for the more adventurous. Exciting night hiking and overnight camping in the wild introduces you to the vast population of nocturnal creatures and the sounds of an awakening rain forest in the early morning. Coffee farmers lead you by foot up the side of the volcano to sample work in the coffee field where you will learn about how coffee is cultivated. Later, you will go back to their home with them and learn hands-on how they process the coffee. You will be shown how to roast and grind coffee with the primitive methods they have used since very early times. At the end of the visit, you will take your own bag of coffee that you prepared and roasted under their tutelage. 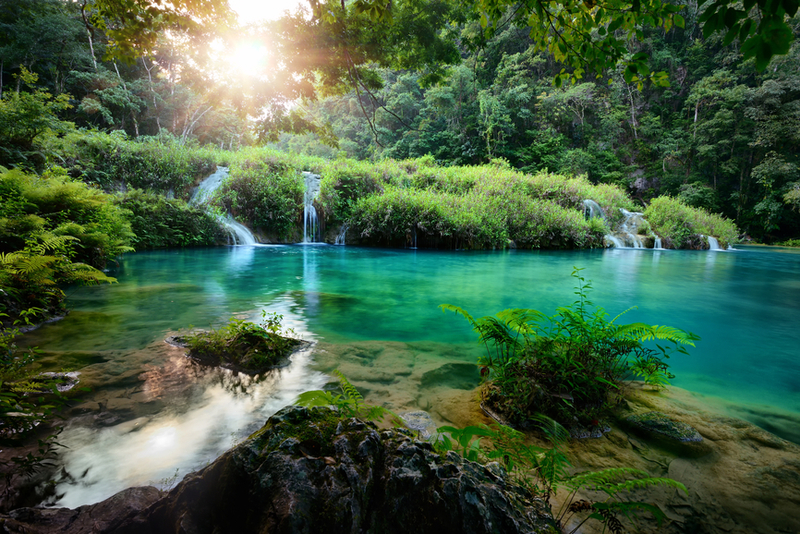 Guatemala is a country full of grand ecosystems. They possess abundant wildlife, volcanoes and caves and beaches. Their ethnic diversity combined with a rich history make it a country of magic and adventure. Millions of species in their unique ecosystems, including birds and insects, mammals, reptiles and fish, dwell among the ancient Mayan cities, forming a tropical paradise like no other.